Hydropower plays a major role in meeting Europe’s ambitious energy transition goals. In addition to providing a large share of EU renewables (RES) capacity, it complements the increasing share of variable renewables in the European power system. As the EU power sector accelerates its transition, the need for flexibility, firm capacity and the ability to balance variable generation increases – this is where hydropower delivers. 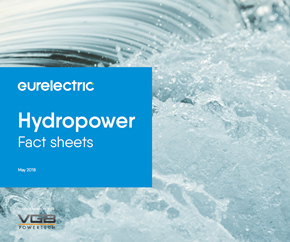 As these as well as other capabilities provided by hydropower are often underestimated, Eurelectric and VGB PowerTech have developed hydropower fact sheets including policy recommendations. These fact sheets were launched at a high-level event in the European Parliament in Brussels, hosted by Angelika Mlinar, MEP. The Fact Sheets are available for download. VGB-S-811-01-2018-01-EN - KKS Identification System for Power Stations - 8th revised edition 2018 now available as eBook! In 2017 the German Federal Ministry of Economic Affairs and Energy (BMWi) initiated a study on available technologies for flexible operation of thermal power plants – the Flexibility Toolbox. This study has been compiled by VGB PowerTech and its Indian partner organisation EEC (Excellence Enhancement Centre) jointly with Steag Energy Services GmbH under the auspices of the Indo-German Energy Forum (IGEF). The toolbox intends to support the change of paradigm in the operation of thermal power plants – from base-load to flexible operation. It reflects that this change process requires suitable technologies, skilled people and leadership with foresight. The toolbox includes 40 different flexibility enhancement measures that require a plant retrofit or major technical intervention. The measures are assigned to different plant areas and focus on combustion, water-steam cycle, turbine, I&C system and auxiliary systems. The toolbox is available for download. As part of the Indo-German Energy Forum (IGEF), the VGB is working together with German and Indian partners to demonstrate the technical feasibility of the flexible operation of Indian coal-fired power plants. The work is supervised by the IGEF task force Flexibility, headed by the Director Operations at NTPC (National Thermal Power Corporation), and is supported by the Excellence Enhancement Centre (EEC). Indian task force members are NTPC, the Central Electricity Authority, the network operator POSOCO (Power System Operation Corporation Ltd.) and BHEL (Bharat Heavy Electricals Ltd.). The EEC – VGB’s partner organization in India – also coordinates the project, which is accompanied on the German side by the VGB, by the Deutsche Gesellschaft für Internationale Zusammenarbeit GmbH (GIZ) as well as by Siemens and Steag Energy Services. In June, a team of experts from EEC, Siemens and VGB carried out test runs in block 6 of the NTPC Dadri power plant jointly with the local operations team. The tests were aimed at demonstrating the operation of the 500 MW block with a minimum load of 40 percent. 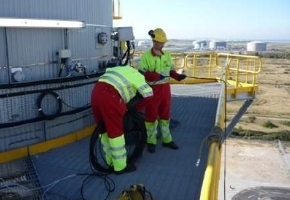 The team succeeded in doing this – the block could safely be operated for five hours with a load of 200 MW. More than 1,000 participants met at the Asia Clean Energy Forum (ACEF 2018) focusing on strategies and concepts dealing with decarbonised energy systems. The forum entitled Harnessing innovation to power the future took place in Manila/Philippines from 4-8 June 2018. The conference programme also comprised so-called Deep Dive Workshops (DDW) looking in-depth at certain issues. In the DDW Grid Integration of Variable Renewable Energy, Dr Claudia Weise from VGB PowerTech reported about the experience made by German utilities with flexible plant operating. A.K. Sinha from NTPC also delivered a paper on the flexibilisation strategies of Indian power plants. Investigations of NTPC reference power plants – jointly carried out by NTPC, VGB and additional partners within the scope of the Indo-German Energy Forum – are also part of these strategies. Flexible conventional power plants are currently the most important option to make energy systems more flexible, thus enabling the integration of variable renewables. However, storage, grids and demand-side integration were also on the agenda of this ACEF Workshop, which was organised by the Deutsche Gesellschaft für Internationale Zusammenarbeit GmbH (GIZ), the United States Agency for International Development, the National Renewable Energy Laboratory and the US Department of Energy. 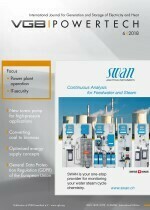 The presentations of the DDW “Grid Integration of Variable Renewable Energy” are ready for download. The VGB Safety & Health Award has been established to increase the importance of Safety & Health in the power and heat generation sector. All ordinary members are invited to propose a project with an outstanding safety & health philosophy and implementation. Proposals of suppliers in this way are also highly welcome! The VGB Safety & Health Award is presented on the occasion of the VGB Congress Power Generation in Transition 2018. Deadline for proposals is August 5, 2018. Stack gas flow rate is required in order to calculate the stack exit velocity and the mass release rate of pollutants, such as NOx, for air dispersion modelling studies, and also for the inventory reporting of total mass emissions. 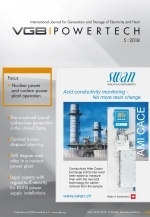 Stack gas flow rate is normally calculated from the fuel consumption or plant output at power stations. compliance with EN ISO 16911:2013. This industry guidance and best practice follows the QA process specified in EN 14181 for Automated Measuring Systems, i.e., Continuous Emissions Monitoring Systems, as adapted by EN ISO 16911. EN 14181 specifies three Quality Assurance Levels for plant monitors: QAL1 Certification; QAL2 Calibration and QAL3 Control. An Annual Surveillance Test (AST) is also specified in order to check the QAL2 calibration by means of annual stack testing using an accredited laboratory. This QA process can be applied to flow calculations as follows: QAL1 Validation (a calculation audit and uncertainty assessment); QAL2 Verification (simultaneously satisfying QAL2 and AST statistical tests) and QAL3 Control (fuel, steam or electricity meter calibration and plant performance checks associated with the calculation inputs). An Excel workbook illustrates how the QAL2 Verification is accomplished and this has been applied to VGB field test results from a Combined Cycle Gas Turbine installation and a coal fired power plant with a ‘wet’ stack. The VGB field test data also indicate that it is possible to use any allowed manual stack test method for these plant types – which were not included in the original CEN validation study - provided that the level of swirl (tangential velocity) in the stack is low. Allowed methods include velocity stack surveys using various types of Pitot tube or vane anemometers and some detailed recommendations are given regarding the calibration checks that are conducted on these instruments. However, tracer gas dilution techniques are also allowed and, since these directly and rapidly determine the volumetric stack gas flow rate, the tracer dilution method has a number of specific advantages for verifying stack flow rate calculations. The 3rd edition of the VGB/BAW Standard S-021 Corrosion Protection of Offshore Structures for the Use of Wind Energy was published for the parts 1-3 in May 2018. Adjustments were made in the chapters scope and surface preparation for the application of coating systems. The changes are clearly marked by grey bars. The VGB/BAW Standard S-021 can be downloaded free of charge and is available in English. The first issue of the VGB/BAW Standard S-021 Part 4 - Cathodic corrosion protection (CCP) of corrosion protection of offshore structures for the use of wind energy is digitally published (PDF) in German in July 2018. An English issue follows within three month latest. CCP is an essential factor in the stability of offshore structures in contact with water. The entire steel structure must be permanently electrically conductively connected with each other for an effective CCP (ICCP or galvanic anodes). CCP can be used in this area alone or in combination with a suitable coating. Owing to the national and international standardization process, the KKS Identification System for Power Stations (KKS) is being replaced by the RDS-PP® Reference Designation System for Power Plants based on DIN ISO 81346-10. Thus, RDS-PP® is thus considered to be a generally accepted good engineering practice and can be applied in planning, construction, operation and dismantling of energy supply plants and equipment as a an unambiguous identification system. Technical progress made over time called for adjustments to the KKS rules. Some examples were added to the KKS guidelines and the KKS keys were updated. This event is addressed to experts of the conventional and nuclear division, to the experts of maintenance in power plants and service companies and to the independent inspectors and deputies of governments, who are engaged in new developments in maintenance, inspection and repair. We are looking forward to receiving your suggestions by 31 August 2018. The BREF-LCP process has been finished last year and the emission ranges (BAT-AEL) have been fixed now. With regard to mercury removal our industry is challenged to meet the new emission limit values, which will become mandatory in the next years. Therefore, it is an urgent need to bring all parties together for an exchange of ideas and experiences regarding the reduction of mercury release into water and air. We are looking forward to receiving your suggestions by 7 September 2018.